Hahaha, gogogo, can´t help myself, but becoming more and more a fan of CSM! Kiddo wrote: Hahaha, gogogo, can´t help myself, but becoming more and more a fan of CSM! I will be more than happy if you cheer for us today ! Be welcomed ! 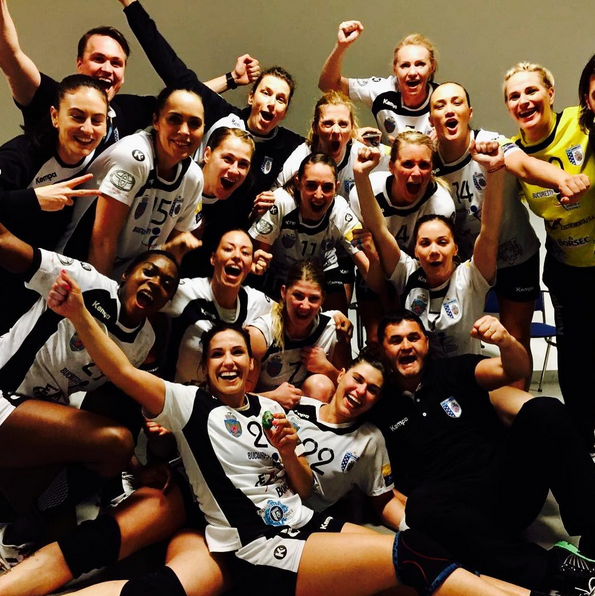 CSM and Larvik the most beautiful teams ! It's not so hard u know I hope Larvik can regroup and regain the momentum they had it before the loss against Vipers. GO CSM , FORZA CSM !!! GO TIGRESSESSSSSSSSS !!!!!! U SPOT YOUR PREY , NOW FEAST ! Of course I cheer for CSM tonight guys. I was so impressed last season when they beat. Rostov. I thought they seemed so strong they would go all the way. I think CSM will do like last year, play their best matches in the deciding rounds. Final4 for CSM for sure. I can´t see FTC win this one. Best of luck and have fun at the match! Must be such an experience!!! Kiddo wrote: Of course I cheer for CSM tonight guys. I was so impressed last season when they beat. Rostov. I thought they seemed so strong they would go all the way. I think CSM will do like last year, play their best matches in the deciding rounds. Final4 for CSM for sure. I can´t see FTC win this one. Best of luck and have fun at the match! Must be such an experience!!! The Tigresses !!! ROAR !!! Isabelle Gulldén ( Bella ) ( The queen of Bucharest ) after the game. We love you Isabelle, we will sing your name every game and you'll have our respect forever. Vice prime minister of Romania, Sevil Shaideh, announced on Monday a new indoor arena for Bucharest (plus those 4 new football new stadiums but this isn't our matter). vlad_impaler wrote: Vice prime minister of Romania, Sevil Shaideh, announced on Monday a new indoor arena for Bucharest (plus those 4 new football new stadiums but this isn't our matter). Antena 3 news , and a "hope". Barry , this is your kind of news , u can trow this at pamflet , exactly like Mircea Badea show. Please , spare me with these nonsense. Are you deaf? You came here with Romexpo utopia whilst this is the vice prime minister of Romania and the indoor arena is in the same group with the 4 stadiums. vlad_impaler wrote: Are you deaf? You came here with Romexpo utopia whilst this is the vice prime minister of Romania and the indoor arena is in the same group with the 4 stadiums. Dream on! The woman says she hopes to, like we hope to...for years and years, since Oprescu was mayor. dydiana wrote: Dream on! The woman says she hopes to, like we hope to...for years and years, since Oprescu was mayor. Money there are (imagine they build 4 new stadiums), all what they get is from the CNI. But I see no will from the city hall of Bucharest to ask? Are they crazy? Congrats to the team but no way any team is favourite! Heavy Final 4. Two different teams , and two different kind of spectators considering it was 1 week ago they played at Bucharest with total different enviroment. Such a shame behavior for some human beings. They could start learn a thing or two from Bucharest fans , or if not us, their friends from Gyor perhaps, they have at least a modern spectators . So much contrast , but when u have football fans in handball halls .. what can u expect ? We proved once more that we love to play when it counts the most, when the match have the highest stakes . Probably i saw Carmen Martin playing for the whole match with her smile wide open on her face, having faith in her team , and enjoying the experience. Again, i cannot stop to regret that i had to see even on TV such a lowsy behaviour from some fans of FTC. Football fans belong to football not to handball. The taste of victory !
) Relax, wait for Dinamo fans, they aren't better. They also have hooligans, you see them in football everywhere. vlad_impaler wrote: :)) Relax, wait for Dinamo fans, they aren't better. They also have hooligans, you see them in football everywhere. u should read more and understand i`m not a fan of Dinamo . And if Dinamo will do such a thing i will criticize the same as FTC or any other team of any nation that has such a hoolingans in their handball halls. With years of delay, at treble cost and half the quality promised. Arena Națională 2.